May 28, 2010, Delray Beach, FL & Anguilla – As a veteran photographer, Thierry Dehove (www.thierrydehove.com) has captured the visual images of some of the world’s most beautiful destinations. As an expert in social media, he has grown a world-wide legion of fans who appreciate his artistry. By combining his photographic skill and social media expertise, Thierry Dehove has strategically grown his business and recently landed the cover shot of Conde Nast Traveler. The magazine’s cover for its June issue features a photo of a stunning villa in St. Martin taken by Dehove. Like with much of his work, the cover opportunity developed because of his ability to connect with others online and across the globe. With a rare mix of technical and artistic abilities, Thierry Dehove has created an international photography and graphic design business specializing in real estate, yacht, and resort marketing that is well-known throughout North America, Europe and, in particular, the Caribbean. With a passion for capturing the uniqueness of islands such as St. Martin and Anguilla, he has established himself as one of the most widely-acclaimed, recognizable photographers of the region. Thierry Dehove actively uses social media sites such as Facebook as a forum for promoting his business and showcasing his photographs. As well, he has an expansive blog/website which he uses as an online tool to inspire other photographers, promote his services, and provide tips and training for professionals interested in learning about photography and website optimization. 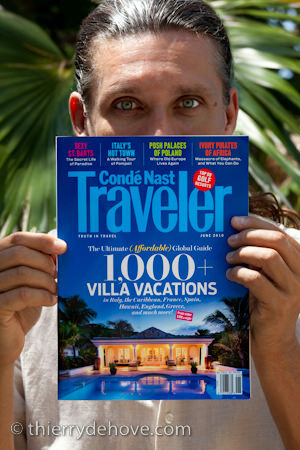 With nearly 1200 followers of his business on Facebook and over 800,000 readers of Conde Nast Traveler enjoying his cover shot, he hopes to continue to capture the essence of some of the world’s most beautiful locations and grow his business through effective online strategies. Educated in the top art schools in Paris, France, Thierry Dehove began his career as an assistant art director in Paris. Working with many top designers and photographers, he worked his way up to becoming studio manager/art director of one of Europe’s top agencies. In 2003, Thierry Dehove launched his own design firm specializing in both photography and graphic design. To learn more, click here. Special Thank to Lori & Steve.